WATERVILLE -- By nightfall Sunday, untracked snow had accumulated around 29 Violette St., the home where 20-month-old Ayla Reynolds was last seen. Candles flickered among stuffed animals and toys at a shrine on the front yard. WATERVILLE — By nightfall Sunday, untracked snow had accumulated around 29 Violette St., the home where 20-month-old Ayla Reynolds was last seen. Candles flickered among stuffed animals and toys at a shrine on the front yard. Last week, TV news vans, Maine State Police vehicles, investigators and curious onlookers had been at the modest gray bungalow every day. By Saturday morning, they were gone. Evidence tape now seals all windows and doors, including the side door where investigators were seen entering the home last week. The garage door is also sealed with tape. An empty police car parked at the end of the driveway was covered in snow. Waterville police held no press conferences over the weekend. In a Saturday statement, Chief Joseph Massey said investigators were working on the case Christmas Eve, but said they wouldn’t be communicating with the media for the time being. Activity outside the police station was light over the weekend. During the previous week, Maine State Police cruisers and Maine Warden Service trucks had filled the nearby parking lots the previous week were gone. By Saturday morning, only Waterville police cars remained. 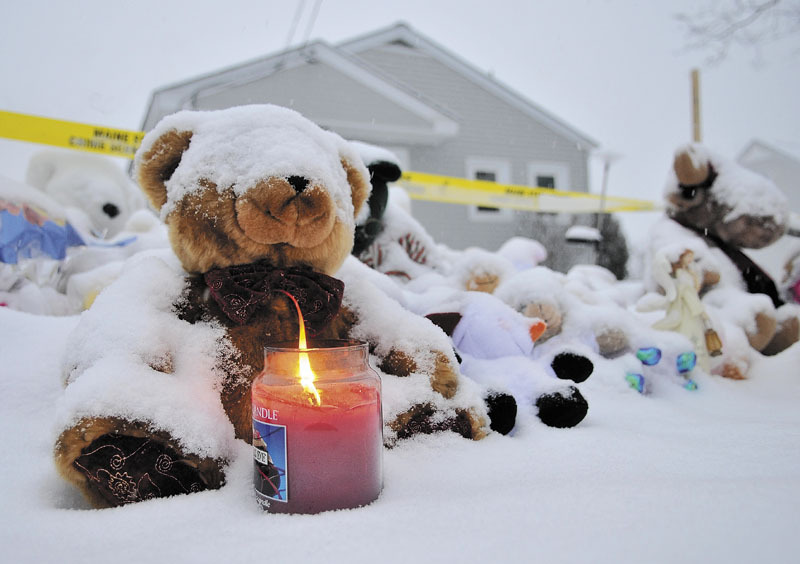 On Saturday, Violette Avenue resident Jerry Nye, 51, placed a stuffed animal at the shrine for Ayla. Nye has lived on the quiet residential street for six years. He said last week’s events have had a palpable impact on the neighborhood. He said the toddler’s disappearance is made worse by the holiday. “It won’t be a Merry Christmas for me,” he said. Ayla was reported missing by her father, Justin DiPietro, on Dec. 17, according to police. She was last seen wearing green one-piece pajamas with polka dots, with the words “Daddy’s Princess” on them. She is 2 feet, 9 inches tall and weighs about 30 pounds. Her left arm is in a soft cast.